With many manufacturers only producing standardised designs for fire doors, we offer handcrafted fire doors to the correct specifications, all with the correct paperwork and certificates. At Trunk doors we have an innovative solution to manufacturing fire safety doors. Every fire door we make is made from high density particle board, we create more than just a beautiful door, the high density board used in the range creates the highest quality fire rated doors. Rated at either FD30 or FD60, depending on the door thickness chosen, our 44mm doors are rated FD30 which are 30 minute fire doors and our 54mm door are rated FD 60 which are 60 minute fire doors. We manufacture the most beautiful handcrafted doors, ranging from an elegant four panel door to a more contemporary vertical panel door. 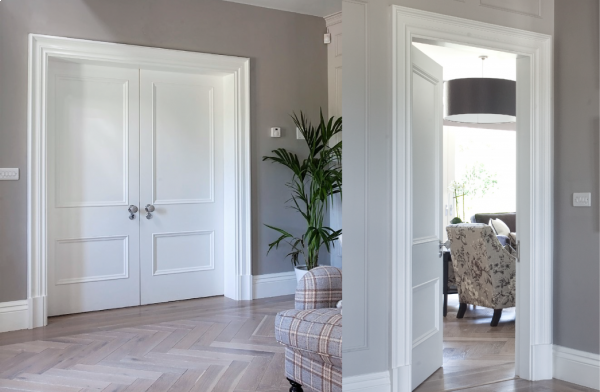 With our passion for design and elegance the perfect fire door can be made to your measurements and to suit your home.